Jim Radintz, USDA’s Farm Service Agency, led a discussion on paths to land ownership including lease-to-own or gradual transfer of interests. Julia Freedgood, American Farmland Trust, shared her experience with non-traditional approaches to helping farmers plan for land access. 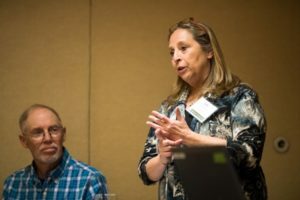 Misti Arias, Sonoma County Agricultural Preservation & Open Space District, described land conservation and easements as a non-traditional approach to securing land tenure. 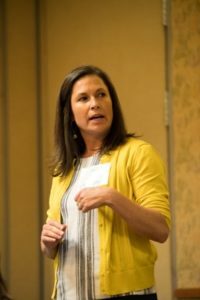 Brianna Bowman, New Entry Sustainable Farming Project, generated the group’s creative thinking on training and mentoring programs to address land access for trainees. Gary Matteson, Farm Credit, explored new and existing strategies to foster land ownership. Non-Traditional Approaches included ownership and farmland investor models, taking on new partners, and the role of incubators and community planning in land access. 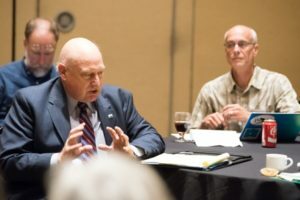 In this track, presenters and participants explored topics ranging from the role of municipal and regional planners, land trusts and religious groups in land access to farmland investment entities. Less-traditional approaches discussed included mixed-member land holding cooperatives, crowdfunding, ground leases, and coupling farm mentoring with succession. Local and regional planners have increasingly engaged in agricultural land use and access. Presenters shared their methods and experiences. In addition, we looked at the role of local governments in making land available and assisting transfers. New and young farmers across the country seek new ways to access land, and are drawn to cooperative, group options. This session explored multi-farmer and farmer-non-farmer land ownership interests–their commonalities, unique challenges and emerging opportunities. Land ownership is the dream of most farmers. 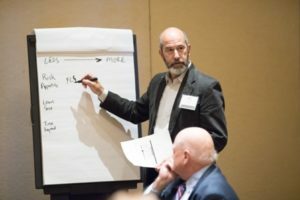 What are established and new strategies for farmers and ranchers to move toward land ownership? Examples included lease-to-own, land contracts, and gradual transfer of interests. What current and potential policies foster a path to ownership? Creative thinking about how land-based farmer training and mentoring programs address land access for trainees. This roundtable drew from participants’ experiences and tackled the synergies between farmer training and land transfer. Sharing research on and examples of farmland investors, discussants set the stage for dialogue, including concerns and opportunities related to farmland investment entities. The following bullet lists feature many of the programs and practices shared by presenters and attendees. It is not comprehensive and does not intend to suggest that these are the only or “best” programs and practices. The bullets are organized by broad topic. 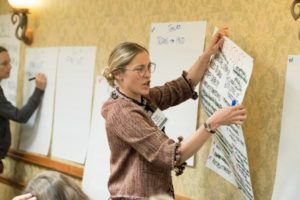 Growing Food Connections—a project out of the University of Buffalo focuses on food systems education for local and regional planners. Local Agriculture Commissions (e.g., Massachusetts): what the Grange used to do. Include land access in county/state food plans. See Massachusetts for example. Specifically address and promote urban farming in state and regional food advocacy groups and plans e.g., Food Solutions New England. Non-accredited investors investing in Real Estate Investment Trusts (REIT) offer mortgage financing to producers. Iroquois Valley Farms is a REIT. Encourage independent investors to invest via CDFI or investment entity to avoid poorly structured deals. Green Sense Farms: online equity crowdfunding for network of vertical indoor farms—raised over $600K. Investor entity exploring mechanism to incentivize and generate return for restoring soils; farmers get a discount on lease while transitioning (Iroquois Valley Farms). Investment entities that put land stewardship and farmer as central, rather than just returns. See, for example, this Farmland Investors Exploration Guide and this Farmland Investment Models Report from Land For Good. Measure environmental benefits to measure climate impacts as part of triple bottom line (Iroquois Valley Farms). Poudre Valley Community Farms multi-stakeholder cooperative to purchase land which farmer rents. With funds provided by the New Hampshire Community Loan Fund, Temple-Wilton Community Farm purchased Four Corners Farm. In addition, TWCF farms land it acquired and donated to land trusts. In 2016 it formed a member-owned cooperative. ORIS’s Fresh Start Farm immigrant incubator: Nonprofit is buying the incubator land on which a farmer cooperative of the former incubator farmers will have long-term ground leases. So the farmers stay in place, rather than moving off the incubator land. Lease fees should cover the ongoing costs to organization(s) such as land trusts. On lease-to-own, suggested “better” practice is not to pay extra “rent” toward land purchase; rather put into a savings account to use at time of purchase. In many cases, land ownership over time through instruments such as LLC, corporation, cooperative, gifting is a more advantageous strategy. Buy-back clause for capital improvements to incentivize tenant to improve the property while protecting him/her if lease terminates early. If the goal is long-term land affordability, allowing the farmer to lease-to-purchase land from a land trust without resale restrictions (e.g., Option to Purchase at Ag Value) does not protect affordability. An adequately paid farm employee could allocate a portion of his/her salary to purchase a share/interest in the land and/or operation. Urge BFRs to focus on earnings, not land purchase. Think about buying land later, doing what you love well, and not being a slave to land payments. Control over the land is the objective; you don’t have to own it. Farm Credit operating lines of credit are applicable to leased land and can be guaranteed by FSA. SILT is working on a donor matching fund to fund farmers’ retirement, built into the farmer’s lease. Carroll County (MD) Critical Farms Program provides easement funds to facilitate land purchase. Reverse mortgage for farm owners. Lender would hold title, perhaps with a commitment to sell to a BFR. Integrate land access education into incubator programs; provide technical assistance to get incubator graduates from incubator land to other land. Couple mentoring with succession; strategies for an apprentice to become successor. Many so-called mentoring programs miss connecting these dots. Educate land trusts to incorporate affirmative agriculture rights into their conservation easements. Engage religious organizations, especially those that hold land. See, for example, Sisters of St. Joseph leasing program and Land For Good’s work with the Religious Lands Conservation Project. Conservation Law Foundation’s Legal Food Hub is a pro bono attorney network in several New England states to assist producers with land (and business). Integrate land access into all beginning farmer training programs. Real estate professional training: see, for example, Land For Good’s real estate professional education program that offers continuing education credits for realtors. Address the policy conundrum in FSA, which disallows junior generation (“non-operator”) from borrowing to purchase interests in the land. Explore and promote use of FSA land contracts. Expand USDA’s Value Added Producer Grants program (VAPG) to encourage BFRs to seek more affordable land further from desirable (direct) markets. Need to build and improve supply chains so BFRs can be viable further from population centers. Work with Rural Development programs to enable BFRs to set up operations in less competitive places; need broadband, for example. Learn more about the Changing Lands, Changing Hands national conference and access the conference program booklet. The program booklet includes session descriptions, and presenter bios and contact information.